SANTA ROSA, Calif. -- An onslaught of relentless wildfires across a wide swath of Northern California broke out almost simultaneously and then grew exponentially, swallowing up properties from wineries to trailer parks and tearing through both tiny rural towns and urban subdivisions. At least 13 people are dead, at least 100 injured and at least 1,500 homes and businesses destroyed, authorities said. All three figures are expected to surge in coming days as more information is reported. Many homes and businesses were evacuated -- some just in the nick of time as flames approached. Vice President Mike Pence, who is visiting California, announced that President Trump approved a "major disaster declaration" for the state to assist in the response. Pence, who received a briefing on the wildfires, said 17 were burning in Northern California. "It's heartbreaking to think that many of the fallen represent our most vulnerable, in some cases senior citizens who simply were not able to escape the flames that overcame their homes," Pence said. "They're in our prayers." 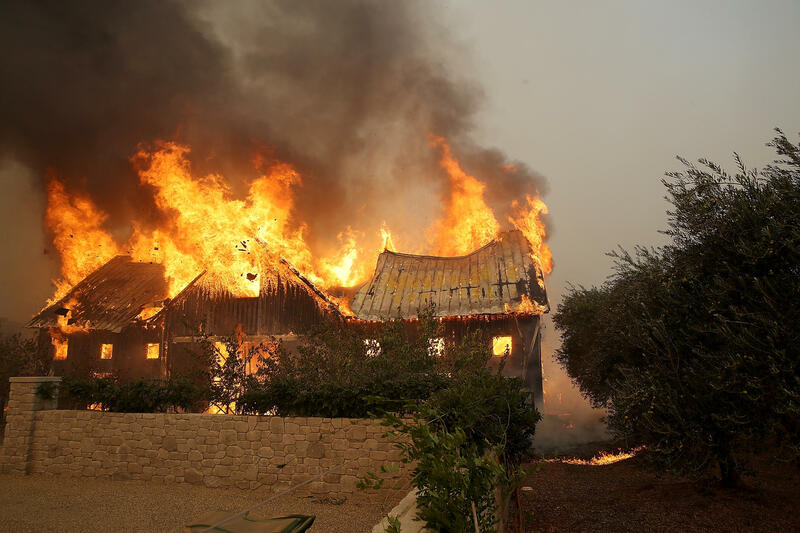 Taken as a group, the wildfires are already among the deadliest in California history. CBS San Francisco reports the fires have consumed nearly 107,000 acres and turned whole neighborhoods into piles of ashes. Residents who gathered at emergency shelters and grocery stores said they were shocked by the speed and ferocity of the flames. They recalled all the possessions they had left behind. Some of the largest of the blazes burning over a 200-mile region were in Napa and Sonoma counties, home to dozens of wineries that attract tourists from around the world. They sent smoke as far south as San Francisco, about 60 miles away. As of Monday evening, 99,000 Pacific Gas & Electric customers were without power because of the wildfires in Northern California, a majority in Napa and Sonoma counties, PG&E officials told CBS San Francisco. In addition, PG&E crews had shut off gas service to about 26,000 customers as a precaution because flames can damage a gas pipe or meter, the station said. Workers in the renowned Northern California wine country picked through charred debris and struggled with what to do after wildfires swept through lush vineyards, destroying at least two wineries and damaging many others. The wind-driven wildfires came as Napa and Sonoma counties were finishing highly anticipated harvests of wine grapes. Monday normally would have found workers picking and processing the ripe grapes to make chardonnay and other wines. Instead, melted and blackened wine bottles decorated the ruined Signorello Estate winery in Napa Valley. People at Paradise Ridge Winery in Sonoma County posted photos of debris and haze, saying they were "heartbroken to share the news" that the winery had burned. Much of the damage in Northern California was in Santa Rosa, a far larger and more developed city than usually finds itself at the mercy of a wildfire. The city is home to 175,000 residents, including both the wine-country wealthy and the working class. The flames were unforgiving to both groups. Hundreds of homes of all sizes were leveled by flames so hot they melted the glass off cars and turned aluminum wheels into liquid. His family and another evacuating with them tried to take U.S. 101 but found it blocked by flames, and had to take country roads to get to the family friends who took them in. To the south, in Orange County, more than 5,000 homes were evacuated because of a rapidly spreading brush fire in the Anaheim area. The blaze had grown to nearly 10 square miles and had destroyed dozens of structures. Plumes of smoke were visible over Disneyland, and officials issued air quality warnings for parts of Los Angeles County. An Anaheim police spokesman says there's been no containment so far. Among those fleeing the flames in Northern California were what the San Francisco Chronicle calls "a who's who of athletes -- Olympians, Hall of Famers." The newspaper says they'd gathered to attend retired football star Ronnie Lott's celebrity fundraiser at Mayacama Golf Club in Santa Rosa. "Former Giants outfielder Barry Bonds wound up shuttling guests who did not have rides away from Mayacama when the villas at the course were evacuated," the Chronicle reports. "Longtime Kansas City pitcher Bret Saberhagen left his golf clubs in the parking lot in order to fit Olympic speedskater Dan Jansen and his wife into his rental car. And onetime Dodgers closer Eric Gagne raised the alarm at a second hotel to which the celebrities were sent, pounding on doors to make sure occupants were out." A 90-mile stretch of the highway is framed by the flames and has been a major concern overnight, said Brad Alexander, a spokesman for the California Office of Emergency Services. Gov. Jerry Brown declared a state of emergency for the fire areas, and asked the federal government to do the same. Pence said at an event near Sacramento that the federal government stands with California as it takes on the blazes, but he made no specific promises.